Turbo pledging 2 Million in discounts in LNG retro? ts at ‘Our Ocean 2017’. LNG as fuel onboard commercial ships. ments to preserve the world’s oceans. Chief Sales Of? cer of MAN Diesel & Turbo. ing the conference included the topics of Climate “MAN Diesel & Turbo believes that it is time for Change, Marine Pollution, Sustainable Fisheries, what we call a ‘Maritime Energy Transition’ to Sustainable Blue Economies, Marine Protection ? nd clean solutions for seaborne trade and trans- Areas and Maritime Security. portation. My company set a new benchmark Read about the world’s ? rst LNG retro? t on a with the world’s ? rst conversion of a container commercial containership in the November 2017 ship from conventional fuel to gas operation. 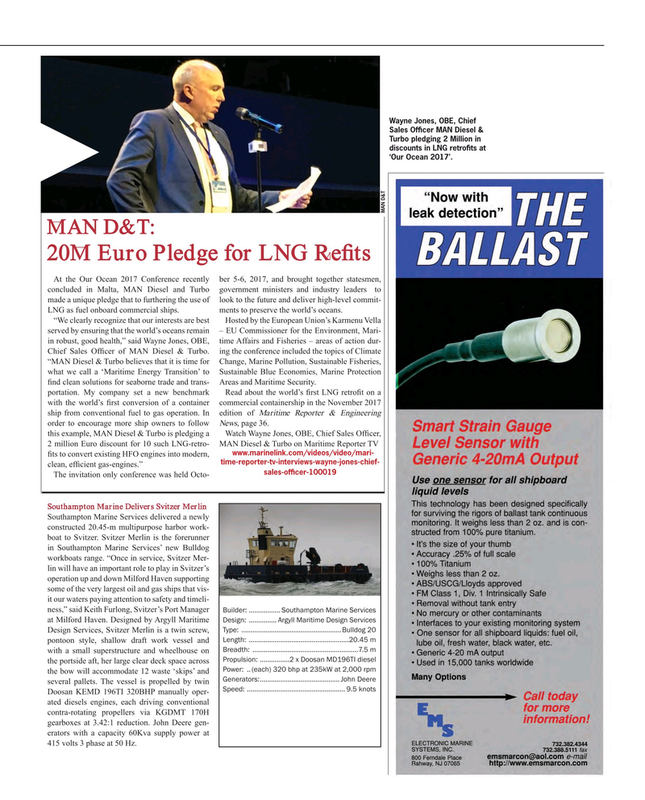 In edition of Maritime Reporter & Engineering order to encourage more ship owners to follow News, page 36. Doosan KEMD 196TI 320BHP manually oper- ated diesels engines, each driving conventional contra-rotating propellers via KGDMT 170H gearboxes at 3.42:1 reduction. John Deere gen- erators with a capacity 60Kva supply power at 415 volts 3 phase at 50 Hz.